Costs (1) less per Attack of your weapon. "Yarrrr" is a pirate word that means "Greetings, milord." 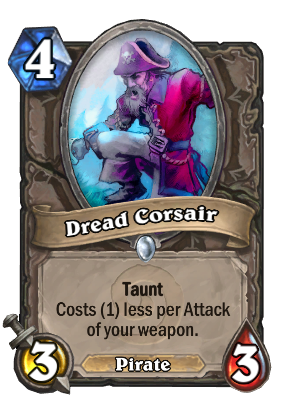 Arguably the most practically useful Pirate; a cheap taunt off a weapon is quite handy. This card finally getting some love, in warrior of all things (Grim Patron style) to help counter the facehunter / agro. Plus as a warrior who doesn't like a 1 or 0 man 3/3 with taunt.